Raffles Place, Singapore – Nami Corporation have announced that Nami Crypto (NAC) has been listed on the ForkDelta since April 12th, 2018. ForkDelta is the second trading platform on which Nami Crypto has been listed; earlier on March 24th, 2018, NAC was listed on Exrates.me. ForkDelta is a decentralized Ethereum Token Exchange with the most ERC20 listings of all the exchanges. It is an open, transparent, fair, and reliable community for traders and investors, where they can easily get access to an open source codebase. ForkDelta always encourages to give feedback on GitHub and is always available to answer investors’ inquiries via the Discord channel. ForkDelta also lists the largest numbers of tokens of all the exchanges with new tokens added every day. Nami Crypto (NAC) is a token of Nami ecosystem, which liquidates transactions on nami.trade, nami.bo, and other platforms on Nami ecosystem.. NAC will act as the trading currency for transactions in EURUSD, GBPJPY, GOLD, OIL, S&P500, DAX, BTCUSD, ETHUSD, BTCETH, NACUSD, BTCNAC, XRPUSD, XRPNAC, and more than 3,000 other instruments. In less than three weeks since NAC was listed on Exrates.me, investors can now trade NAC on the ForkDelta trading platform. Nami team is trying our best to increase the number of exchanges on which NAC can be traded on, in order to bring the most favorable conditions to the community of Contributors who want to trade and support NAC. 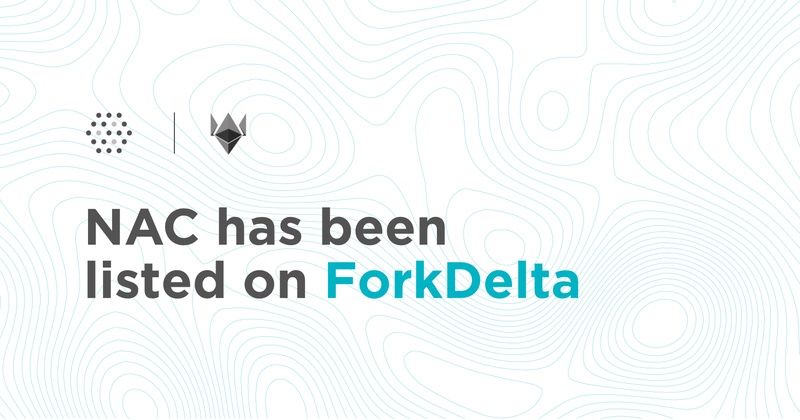 See more information about trading on ForkDelta here.